If you thought Hellboy's story had come to an end, think again. Hellboy creator Mike Mignola has signed with Dark Horse Comics to write a new original Hellboy graphic novel called Hellboy: Into the Silent Sea. The project will be co-written and illustrated by Eisner Award-winning artist Gary Gianni. The book will be colored by Dave Stewart. The story is a sequel to the story "The Island." Hellboy is taken captive by a phantom crew on a ghost ship that intends to sell him to the circus as an oddity. The captain of this cursed ship seems to be channeling Captain Ahab with his relentless determination to track down a sea creature he must capture at all costs. Gary Gianni said if the story were a feature film an announcer would have to describe the action in over the top terms. He gave it his best narration: "it's Hellboy as you've never seen him before, laughing, loving and battling his way across the stormy seas! You'll be thrilled as he faces cosmic forces terrorizing a haunted ship manned by a desperate crew! Be sure not to miss Hellboy: Into the Silent Sea, the biggest comic book event of the year!" This will be the third Hellboy original graphic novel. 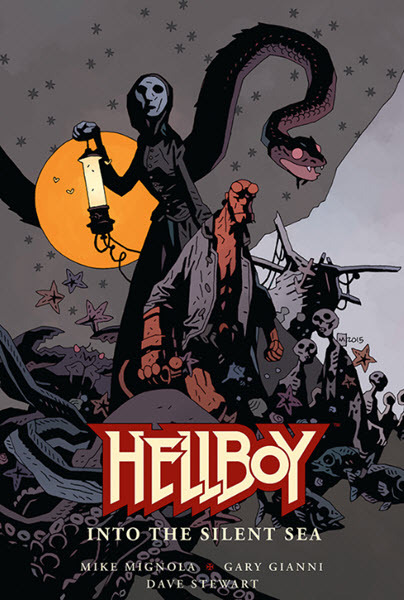 The first two in the series are Hellboy: House of the Living Dead by Mignola, Richard Corben and Stewart and Hellboy: The Midnight Circus by Mignola, Duncan Fegredo and Stewart.